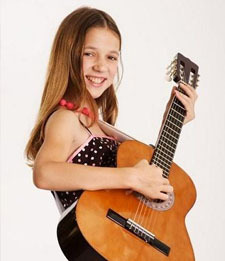 Our guitar teachers teach all genres of music from rock, blues, metal, folk, country, pop and classical guitar lessons on acoustic and electric guitars. We teach bass guitar as well. Our teachers will take the time to get to know your interest and goals and personalize a program to have you playing the music you want to play. The teacher will emphasis the technique needed to make each piece a dynamic performance. You are encouraged to bring music to your teachers attention that you want to learn to play.